The main hall is approximately 17 metres long and 8 metres wide. It has a maximum capacity of 155. There is a stage at one end . 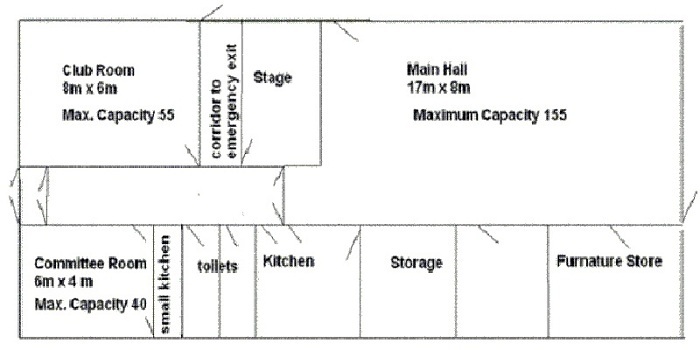 The stage is 1 metre above the hall floor level and is 5 metres wide and 4 deep. The stage has a draw strung stage curtain. 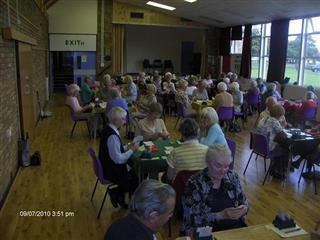 The Hall has direct access to the kitchen and the main store room where the tables and chairs are kept. The hall has a sprung wooden floor suitable for physical activities such as martial arts and keep fit. It is not suitable for ball games. 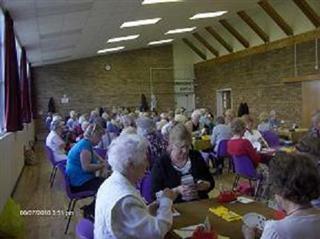 The club room is approximately 8 metres long and 6 metres wide. It has a maximum capacity of 55. There is a wall at one end that has been whitewashed to make it suitable for use as a projection screen. The room is carpeted and not really suitable for physical activities. Kitchen facilities are available via the main kitchen. The committee room is approximately 6 metres long and 4 metres wide. It has a maximum capacity of 30. There is small kitchenette in the room suitable for making tea and coffee. Each room has its own supply of tables and chairs in number suitable for the size of the room. We do not have any children’s furniture or play equipment available to rent. The hall is an excellent room for a birthday party or other celebration, but is also very busy and is best booked well in advance. As an alternative, you might consider hiring the two small rooms together. 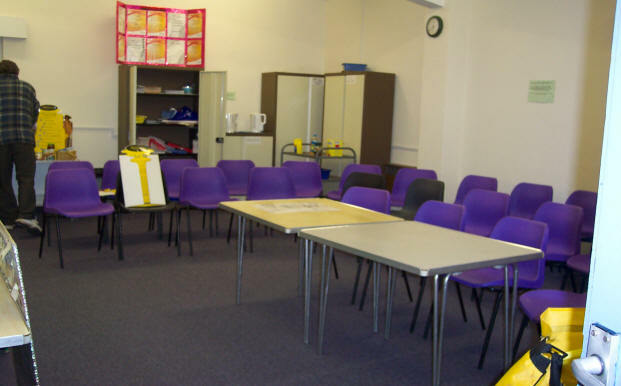 The committee room can be set up ‘boardroom’ style as a place to eat, whilst the club room can be used for your party games and entertainment. You’ll still have access to the kitchen if you need it for food preparation, but it’s worth keeping in mind that if the hall is booked for a party at the same time then you’ll probably be sharing the kitchen. The main kitchen is a shared facility between all the rooms, so please be considerate when using it. The only way to have exclusive access to the kitchen is to hire the entire building. The kitchen is equipped with a large range style gas cooker consisting of two double ovens and an eight ring hob. There is a continuous boiling water boiler with a twenty litre capacity. There are ladies and men’s toilets as well as a separate unisex disabled toilet. Again these facilities are shared between the three available rooms and the only way to obtain exclusive access to them is to hire the entire building. We have some limited storage space available for groups who have regular bookings at the community centre. It is available on a first come first served basis. We do not charge for this service.